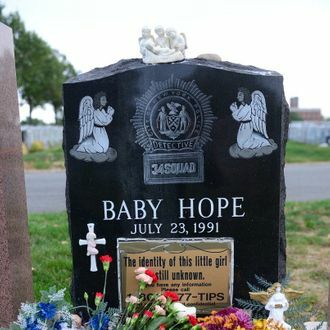 In an interview with the New York Times, the man who confessed to killing Anjelica Castillo, known to the public until recently as Baby Hope, said he didn’t do it, though he helped dispose of the body. But Conrado Juarez’s explanation is pretty thin. Amid copious details about Anjelica’s troubled home life, Juarez, who told police he smothered her with a pillow after sexually assaulting her, said police coerced his confession. But his alternate version, while not impossible, is not exactly plausible. Juarez said his sister, with whom Anjelica lived, had called him on his cell phone one day in 1991 to say that Anjelica had fallen down the stairs and died. But the Times points out: “For Mr. Juárez’s account to be accurate, then Mr. Juárez, a kitchen worker who did not speak English or have working papers, would have been one of fewer than 3 percent of people in the United States who had a mobile telephone in 1991.” That’s not to say it couldn’t have happened, but it’s unlikely. Juárez “said he was resigned to spending the rest of his life in prison,” which seems more likely.